Highlights – Rotating screen gives you four versatile modes: Laptop, Tablet, Tent and Stand – Touchscreen control and Windows make computing fun, fast and intuitive – AccuType keyboard is comfortable to use during long work sessions – great for students – High performance i5-6200U processor Create This laptop is part of our Create range, so you be certain that it has the power to help you bring your ideas to life. It’s specially designed for graphic design, music production, photo editing, and film making. Four ways to work Whether you need the stability of a laptop or the flexibility of a tablet, the Yoga 500 lets you work the way you want. The 360° rotating hinge gives you four modes to choose from: Laptop, Stand, Tent or Tablet. Whether you’re typing up an essay, shopping online or watching a film, there’s a mode to suit you. Reliable performance Powered by an Intel i5 processor, the Yoga 500 delivers impressive everyday performance. Multitask and run several apps at once, browse the web or download music without worrying about your laptop slowing you down. Comfortable computing Ideal for working on documents on the move, the AccuType keyboard keeps you comfortable during long typing sessions. The individual keys are spaced to prevent mistyping, so you can enjoy increased accuracy along with reduced strain and fatigue Windows 10 Windows 10 features the new Edge browser, which gives you a much bigger viewing area for enjoying your online content at its best. You can write notes directly onto web pages and share them with anyone – perfect for students or business. Working between different software or keeping an eye on social media while you work has never been easier; you can now snap up to four apps to any location on the screen for effortless multitasking. You can even create individual desktops for specific projects and tasks. 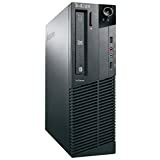 Lenovo (formerly IBM) is the largest PC manufacturer in the world and has been at the summit for a number of years now, producing some of the highest quality equipment on the market. Their flagship ThinkCentre range caters to medium-large business enterprise customers who demand high-end performance and full accessibility for their machines. The refurbished range has recently increased in popularity with home users recently due to the power and speed capabilities in comparison with similarly priced new computers from high street retailers. The Lenovo M81p comes with a Sandy Bridge 2nd generation 3.10GHz Core i5 processor and integrated Intel HD Graphics. This model also comes with 8GB of memory for operational efficiency and a huge 1TB hard disk drive for storing documents, photos and videos. The M81 has VGA and DisplayPort (HD) video output, a serial port as well as x8 USB 2.0 slots, audio input/output and wired Internet connectivity.